Square Enix’s celebrated retro-styled J-RPG, Octopath Traveler, will be throwing off the shackles of Switch exclusivity on June 7th when it comes to PC via Steam. That’s not exactly a surprise, given that Square managed to leak the news on its own website last week, but at least we now know that nothing has changed since then. And it’s welcome news too, given that Octopath Traveler is a generally superb effort on Square’s part, and one of the more eye-catching J-RPGs of recent times. 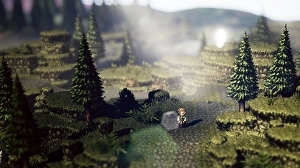 Octopath Traveler, which debuted on Switch last July, has two main tricks up its sleeve: the first is its gorgeous, immediately striking art style, which reimagines the classic 16-bit J-RPG aesthetic into full 3D – with chunky pixels still in tact (Square calls this “HD-2D”).